At long last, it has arrived! 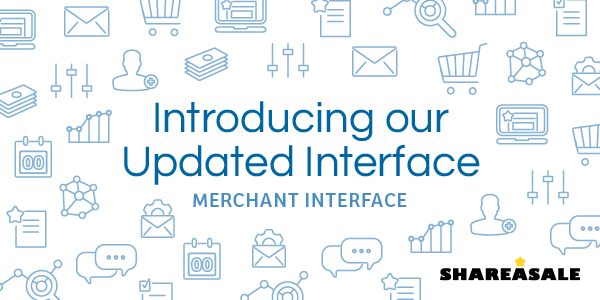 We are excited to introduce the latest Gen 7 interface update. We hope this redesign will provide a more enjoyable experience while performing your daily management tasks and help you access data and tools quickly and easily. The activity feed is a new feature that lives on your dashboard. The real-time notifications will help you keep a pulse on your program and discover information and action happening within your account. What can you expect to find in the newsfeed? We are excited to introduce a few new reports that will help you understand your program. This report breaks out three different transaction metrics: Coupon Code, New Customer Flag and Mobile. Now you can check in on your daily progress by the minute! This brand new report gives you insight on new metrics like Top Social/Referring domains. Explore our new Clickstream graphs to gain a deeper understanding of how Affiliates perform in conjunction with other clicks and affiliates. 1. The Personalized Commission Rule log (or PCR log) will tell you detailed information about the commissioning schedule for that transaction. 2. Alerts – We will flag possible duplicate or other troublesome IP addresses for you to review. 4. Clickstream Data – Get a clearer view of all the clicks involved in a single transaction. Each transaction now tells you how many Affiliates and clicks are associated. Ledger Report – You now have a clear and full picture of how your activity has impacted your overall balance. While still used primarily for accounting purposes, you can view a transaction breakdown by type and a snapshot of key program activity during your selected timespan. Column Manager – Year in Review / Affiliate Timespan / Weekly Progress now has a Column Manager to allow you full customization of your report view. Select from the options provided and watch your table dynamically change! Compare dates – Weekly Progress and Affiliate timespan allow you to easily compare performance across two timespans. Choose our quick select options of Previous Year/Previous Period or select your own comparison dates to measure progress. New Report Graphs – let your data come to life with our helpful interactive graphs. 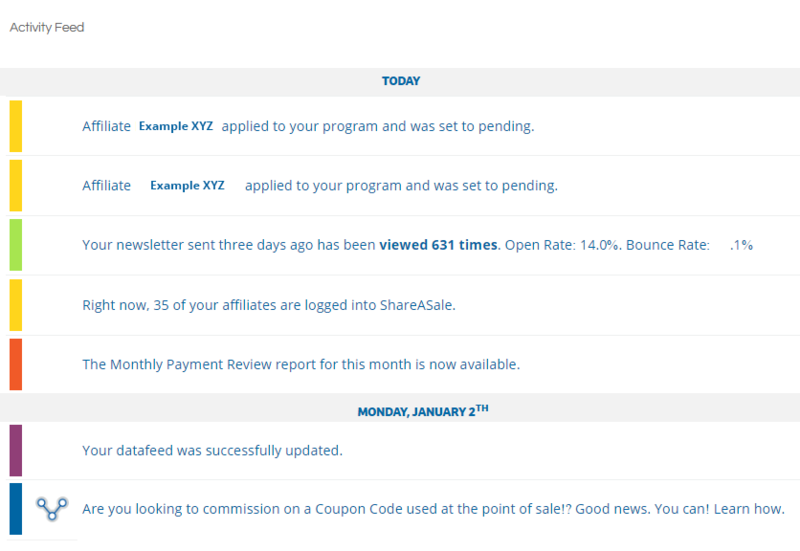 From our new “Top Five” style horizontal bar graph in Affiliate Timespan, to the Coupon Code Usage report in Transaction Breakout, you will have a clearer understanding of your reporting with just a glance. 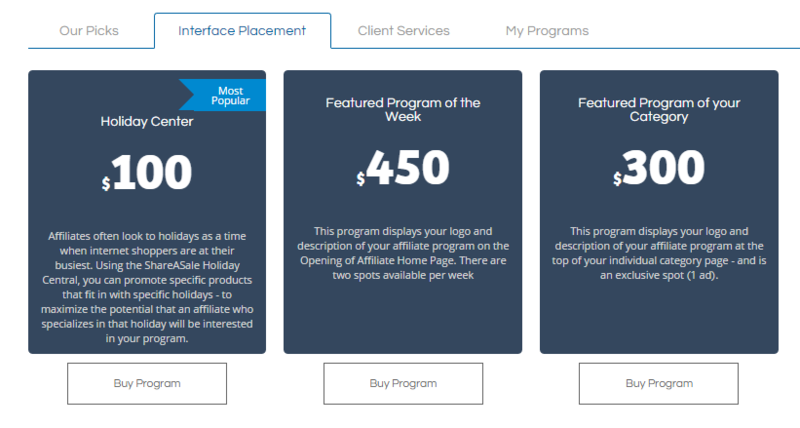 Program Views + Affiliate Log in alerts – Now you can get a better idea of your Affiliate’s on-site activity. New report insights show you when they’re logged in and when prospective Affiliates are viewing your program through the interface. Find this info in your dashboard activity feed and on the Today at a Glance Report. You can now set up newsletters to send automatically based on a trigger such as performance metric or signup date. From there you can add conditions to take the manual work out setting up newsletters and start communicating strategically. Now when you set up a new banner or text link, you can choose the option to turn it into a coupon. You can choose from your list of existing coupons or create a new one to associate the banner or link with. Your Co-Branded Recruitment URL is key for recruiting new Affiliates to join your program. Now you can edit this link and customize it to a friendly short link! If you like to track where your sign ups are coming from you can also add a “sign up source” to be included in the short link url. Find this under MY ACCOUNT > Account Details. In the top panel. There is a long list of ways to commission Affiliates and each of the commission options you select has a priority in the order in which they run. So, when you are utilizing Commission Rules, Conversion Lines Multiplier, Personal Commissions, Group Commissions and Performance Tiers…. it can be pretty tricky to know where each will rank in a given transaction. The commission portal will give you a starting point by listing the lowest priority at the top and the highest priority (meaning will trump all other settings) at the bottom of the list. Along the way, it will tell you how many configurations of each you have running. Application Rules – You may want to append form fields or other applicant information to our standard application form. From there, you can create auto-approval rules or generally be able to make a more informed decision on your incoming applications. Conversion lines – you can now find this heavy hitting attribution tool in TOOLS> Conversion Lines. Recruitment Tool – sign up right from the interface! Merchants can choose from one of two different program agreement extensions and receive access to the tool. Want to learn more? Tune into our daily webinar walkthrough starting Monday, January 9th, 2016. Stephanie is Senior Product Marketing Manager at ShareASale. 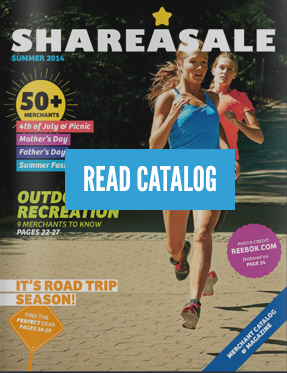 With a thorough understanding of ShareASale's product and tools, she is able to help build the bridge between our customers and our technology. When not planning updates to the interface or brand guide, she is focusing on how to best deliver clear and consistent messaging about our product and services. In her spare time, Stephanie caters to the needs of her Pug, Dublin, and Japanese Chin, Mika.